Pitchstone is a volcanic glass which occurs across Arran. Pitchstone was used on the island from the Mesolithic to the Bronze Age, and also found across Scotland during the early Neolithic. Pitchstone artefacts have even been discovered on some of my own projects, so I was very keen to explore the landscapes from which it originates. Unlike the Neolithic stone sources I am familiar with in the Lake District, no evidence remains of pitchstone quarrying. Geologists have discovered dozens of locations where it is accessible, but we don’t know precisely where prehistoric people gathered this distinctive raw material. I decide to visit a variety of pitchstone locations. Drawing upon my Lake District experience, where Neolithic people visited the highest mountains to obtain rock, the first I visited was high on the mountains in the north of Arran. I started this walk near Brodick, and climbed rapidly on faint paths towards the peak of Beinn Nuis. As I neared the location of the pitchstone, the rock scenery became increasingly dramatic. Approaching along the ridge from the south, one rock formation in particular first appeared as a precarious stack of enormous granite blocks. From the side, it unexpectedly adopted the form of a human head. It is a widely known feature known as the Old Man of Tarsuinn. The Old Man of Tarsuinn presides over the place I am seeking. 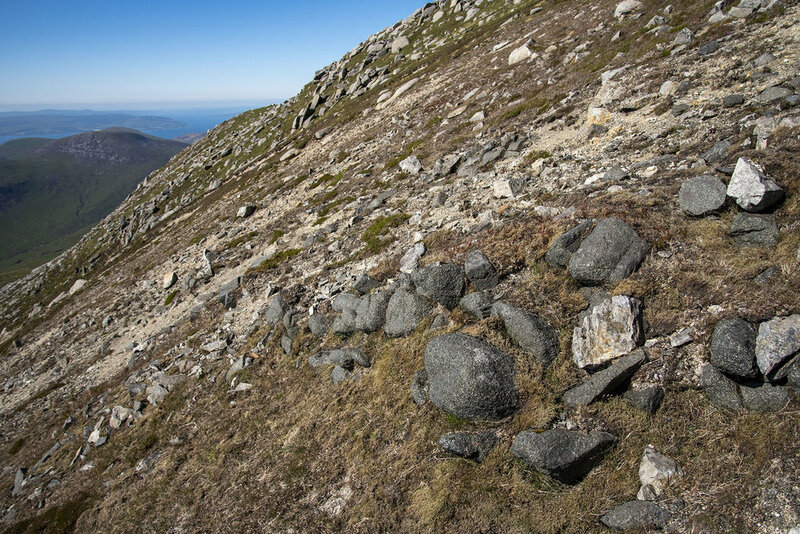 A steep and rather forbidding slope is a location where porphyritic pitchstone occurs. I begin to find rocks which were quite distinct to the surrounding granite. I did not need to understand the chemical processes involved in pitchstone formation to recognise the something distinct was happening to geology on this mountainside. Soon I began to find fragments of fractured pitchstone that confirmed that I was in the right location. While it is unknown whether prehistoric people visited this source of pitchstone, the location had many characteristics which reminded me of the Neolithic. The mountains are covered in extraordinary rock formations which frequently look like built monuments. This is also a spectacular and precarious location - precisely the kind of setting which people visited when quarrying stone in the Lake District.